This past weekend a few of the Lucky Sportfishing & Eagle Nook team headed up to the resort to work on a few small projects, get our new maintenance man Kevin settled in, and of course get out fishing. One of the more major projects to be completed before the season starts is putting down new flooring in one of the guest cabins. We picked the flooring up last week and were able to bring most of it down the Alberni canal with us without over-weighting the boat; the rest will come up on one of our many other upcoming trips to Barkley Sound. After checking in at the resort and dropping off the flooring on Friday afternoon we headed out to Swale Rock in hopes of landing a couple fish, and we weren’t disappointed. Within seconds of putting the first rod down we had a fish on and put a nice mid-teen Chinook salmon in the box. We were playing fish from then until sunset and limited out, with the biggest being a solid 20 pound Chinook. 20lb Chinook at Swale Rock this weekend. Saturday morning we were back out for a couple hours and put three more Chinook in the box before heading to Ucluelet to pick up Kevin and get him settled into his new home up at the resort. We’re excited to be welcoming him onto the crew to take over the last six weeks of the winter caretaking position, work on various projects around the resort (including the cabin floor) and then continue on as our summer maintenance person and water taxi captain. Sunday morning we spent a couple hours Halibut fishing but the wind came up outside of the Sound so after a short effort we decided to pull the pin and head back inside where it was calmer. In spite of the wind the weather was unreal all weekend, and after a quick stop back to see Kevin before we headed out, our run back up the canal on Monday morning was an easy flat-calm cruise. There’s just over 6 weeks until we head up for the season, and lots to be done in the meantime which means almost every other weekend until mid-May we’ll be back up in Barkley Sound working on maintenance projects, getting the property cleaned up, and of course fishing! As the days get ever longer, and signs of spring are all around us (the sun has even made a few brief appearances in Victoria over the last week), we’ve officially started the countdown until our 2017 season gets underway. In just over 8 weeks we’ll start our annual migration back to Barkley Sound in preparation for a summer that’s sure to be full of great fishing, beautiful weather and ample time to relax by the water (for our guests at least!). Between now and then we’ve got several shorter trips out to the resort planned to work on various projects and make sure everything is running smoothly before the doors officially open to our guests. The crew(s) that head up on those maintenance trips will most definitely get out fishing at least a handful of times while they’re up, and those of us who stay behind will be looking forward to our first Barkley Sound fishing report of the year. We did already catch word that the Sproat Lake Loggers’ Derby, which took place the first weekend of March, had another successful year in Barkley Sound. We’re excited to get out and test the waters ourselves, especially during the two derbies being hosted at Eagle Nook Resort this spring. While a small team of staff will be on site for those pre-season salmon derbies, happening the first two weekends in June, the remainder of the group will join us just 4 days before our regular season opening on June 15th. We recently welcomed Ashley, who will round out our 2017 guest services crew, and our team is now close to being fully hired and looking forward to spending their summers on the West coast. We have a couple spaces still available for our opening weekend, June 15th – 18th, and early season fishing promises to be good so get in touch with us soon if you’re thinking about a fishing trip to kick off your summer! March on the West Coast means spring is on it’s way, and it’s been a cold, wet and sometimes snowy winter on Vancouver Island so we’re definitely looking forward to warmer weather and longer days. One major indication that spring is just around the corner is the herring spawn which has started all along the South coast of Vancouver Island. If you’ve been near the water at all in the last couple of weeks you may have noticed the turquoise blue colour that indicates where the fish are laying their eggs. In the Pacific Ocean herring travel and spawn in schools along the coast of Baja California all the way up to Alaska. Warming water temperatures trigger herring to spawn hence why every year around Vancouver Island and mainland British Columbia spawning occurs in early to mid March; schools further South can spawn much earlier in the year while schools further North spawn later. The herring spawn is an important event on the West coast for multiple reasons, one of those being that herring and their roe are a major food source for seabirds, seals, sea lions, whales and other fish, including Chinook salmon. Like many other fish species, where herring spawn is often not where they live year round so at a time of year when other food sources can be scarce, returning herring provide a welcome relief for predatory species on the West coast. One of those predatory species are Humpback whales who start their annual migration North to coincide with the herring spawn, traveling from the coasts of Mexico and Hawaii Northbound to British Columbia and Alaska. They often feed close to the shore, and a ring of bubbles on the surface of the water is a telltale giveaway that a Humpback is circling below, trapping herring and other bait fish within a ‘bubble net’ before it lunges through them with it’s mouth gaping open for a quick meal. Humpbacks can consume up to 1500 kilograms of food in a day so it goes without saying that where there are whales there are herring, and where there are herring there are also salmon. Off the coast of Vancouver Island and British Columbia mature Chinook feed predominantly on bait fish and returns of herring this year are predicted to be great, so although the DFO hasn’t released any official outlook for 2017, we’re sure the salmon will come with them. The 2017 season at Eagle Nook will open June 15th and we’ve still got a couple early and mid season dates left but they’re booking quickly and in most spots we’ve only got one boat open so get in touch with us soon if you want to have an unforgettable fishing trip on the West coast this summer! In west coast fishing news, the Department of Fisheries announced a coast wide halibut fishery opening effective as of February 1st after the International Pacific Halibut Commission meetings in January. Initially it was proposed that Canada’s halibut catch limits in 2017 be reduced around 25% from last year, however that outlook changed after reps from the West Coast Fishing Guide Association argued a strong case for how well the fishery in British Columbia is managed in comparison to other regions. In British Columbia catch is closely monitored and recorded, with size limits being strictly adhered to. It’s assumed that extremely large halibut make up the breeding stock so in order to ensure the health and abundance of this stock, no fish over 133 centimetres (about 52 inches) can be retained in Canadian waters. A 133 centimetre halibut weighs between 65 and 70 pounds which is still a large fish by any standard, and the quality of the fillets are exponentially better than what would come from anything bigger. The regulations that we adhere to in British Columbia have resulted in an increase in both the size and numbers of halibut in Canadian waters over the last several years – a clear indication of a well-managed fishery and a guarantee of great fishing for years to come. The outlook for the Chinook and Coho fisheries in British Columbia for 2017 is similar to last year, with catch limits likely remaining the same. Daily limits are two of each species per license, with four of each in possession at the end of your trip, which translates to a full box of fish to take home! Fishing in Barkley Sound was great all round last year and although the Department of Fisheries hasn’t released any official forecasts for the 2017 season yet we’re anticipating another great summer on the west coast! Even in the “off-season,” when the days are colder and the salmon are a little smaller, our staff and guides can’t help but get out on the water and do what they do best, fish. This past weekend a couple of our longtime guides Matt and Kylan, as well as Alli, who just signed on for the 2017 season with us, were out near Sidney and the Gulf Islands hoping to get into a couple winter springs – which they did. Here’s Alli with a Chinook they landed; winter fishing around Southern Vancouver Island has been great this year, with some fish as big as 15 or 16 pounds being caught off the Victoria waterfront. A couple of weeks ago Trotac, a local marine supply company and one of our partners, hosted their annual winter fishing derby. Some of the Lucky Sportfishing team took part, limited out and got to enjoy a flat calm and sunny day on the water – the best way to spend a Sunday! We also donated an all-inclusive Eagle Nook Resort derby package to Trotac for one of their prizes – the lucky winner will be enjoying 3 nights accommodation, all their meals, guided fishing and the chance to take home yet another derby prize this June! In other Vancouver Island fishing news, The Department of Fisheries announced yesterday that halibut fishing is open as of February 1st, so next time we head out we might just switch it up and drop the anchor for halibut instead. Eagle Nook’s doors will open for 2017 in 120 days (not that we’re counting down or anything…) and we can’t wait to get back up to Barkley Sound for the summer runs of bigger salmon, longer sunnier days, and of course another great season spent with new and old friends on the west coast of Vancouver Island. We’re booking new trips in everyday so let us know soon if you want to join in on an unforgettable summer in Barkley Sound! https://eaglenook.com/wp-content/uploads/2017/02/15940598_10154020906766266_3913705550941621139_n.jpg 540 960 eaglenook https://eaglenook.com/wp-content/uploads/2017/11/White-Shadow-2017-ENR-Logo-trans-e1512100309952-1030x405.png eaglenook2017-02-02 11:54:192018-04-12 10:14:22Fish Onnnnn! Our 2016 season ended on a high note with sunny weather and consistently good fishing right through until our last open day. The whole crew at Eagle Nook and Lucky Sportfishing would like to thank everyone who came and stayed with us this summer for being a part of making the season such a great success! The resort is now shut down for the winter but we’re already taking bookings for 2017 – call or email us today to set up the ultimate fishing, dining and adventure package for next summer! The guys from Yaskawa Engineering and Advanced Electrical were out last weekend for their fifth annual trip with us. The beautiful weather held out, as well as the great fishing, and everyone went home with full fish boxes at the end of the weekend! The group from Sonepar Electrical came out to Eagle Nook this past weekend for their fifth annual trip. The weather was unreal, and the fishing was even better! Looking forward to doing it again next August! Lisa is a guest and friend who has been returning to Eagle Nook for many years – she was also a part of our first annual Eagle Nook Derby earlier this season! Here she is on Dan’s boat with a Chinook she caught last week during another visit to the coast. New and returning guests were out on the water today, making up four different groups. Everyone had an awesome day out there, with limits on Salmon and Halibut! The Kalb Contruction group made their annual trip from Las Vegas over the weekend. Their haul was so great we had to send their fish on a separate plane back to Vancouver! Midwest Floor Coverings from Salt Lake City, Utah, had four groups come out to Eagle Nook at the end of July. All groups had a great time on the water and at the resort, and everyone took home coolers full of salmon, halibut and rockfish! Jenna, Rick, Robbie and Steve (not pictured) booked with us at the Abbotsford Sportsmen’s Expo in March and were out this past weekend. They caught this 68 lb Halibut on their second day of fishing! All the way from Las Vegas, the Bedard family is back for their fifth visit to Eagle Nook. Here are Camille and Linda showing off some of their catch from Day 1 of their trip – still 2 full days of fishing to come! The Willock, Lackey and Sukkel families were up last weekend and had great success in their two days of fishing. Here are Mike, Cindy, Trudy, Bob and their guide Dan on their final day – limits on Chinook and Halibut in the same day! Rob and Jesse with a nice halibut caught during their weekend trip. Bottom fishing has been great, with some big halibut, lingcod and rockfish coming back to the dock daily. We had a couple days off between trips this past week which meant our team had some time to head out and do some fishing in the Sound. Jan netted this Chinook on the night bite! Shannon and her husband Fred booked a last minute trip last weekend, driving out to the west coast from Alberta! Here she is pictured with guide Trevor and nice Chinook caught off his brand-new boat! KLB Construction from Seattle had a great trip last weekend. Everyone limited out and took home a box full to the top with salmon, halibut and lingcod! The Eastwood group visited us from Whistler, Toronto and Myrtle Beach, South Carolina last week. Here’s Rick looking just a little excited about a beautiful fish! Four generations of the Reid family came out for our last trip. They had some great days on the water and even bagged the first Tyee of our 2016 season, weighing in at 34.6lbs! After lots of hard work by Dennis Hetu, our brand new Eagle Nook Welcome sign is up on the dock! The Kuzyk family took the first fish pictures with the new sign – a successful first day on the water yesterday with Dave landing a 24lb Chinook (pictured far left) along with some nice mid-teeners. Our second pre-season derby of 2016 was a huge success – pictured here is Marcus with the top prize winning fish, a 23.6lb Chinook caught off of Long Beach. Salmon are moving into the Sound and we had quite a few 20+ lb fish caught over the weekend. Last weekend was the 5th annual Lucky Sportfishing Derby at Eagle Nook. 45 guests came out to try catch the biggest salmon of the weekend – the prize-winning fish was a 21.5 lb Chinook caught by Jesse Fisher (not pictured). Our guests, guides and resort staff are looking forward to an awesome season ahead – our official opening day is Sunday, June 12th! A couple of our guides entered the 2016 Sidney Derby on May 7th. Although they didn’t win they had a great time on the water and got a few nice salmon. Always a great call supporting local salmon enhancement projects! Department of Fisheries and Oceans Preliminary forecasts are out and participants from the most recent set of planning meetings this past weekend are saying that for the West Coast of Vancouver Island this season is going to be the Chinook Salmon run of the Decade! This is still not the full story, alongside and mixed in with this run as they land in the approach waters of Northern Vancouver Island then migrating south, will be the annual mass migration of aggressively feeding Columbia River Chinook. The adults this year are coming off of a record brood year from 2013 when over 1.2 million adults returned. With ocean condition indicators and the other voo-doo the fish wizards add in, they expect an above average return. Which in other words means over 800,000 Columbia River Chinook will be in this same area over the same time frame. Combine these Southern US bound with Canada’s West Coast Chinook Salmon returns and there are going to be over 1,000,000 Chinook Salmon foraging on their way South from Northern Vancouver Island to Southern Vancouver Island during June, July and August. Lucky Sportfishing in Sidney, Vancouver Island BC this week. The Island is starting to see great fishing in the early season. This fish was caught on Jeff’s boat but several other LSF guides have had some nice fish this past week. Early Season Chinook Salmon are in Barkley Sound. Had a great weekend with friends up at the Resort. We are not open yet but working at Eagle Nook Resort and Lucky Sportfishing has it’s perks. We love Salmon fishing on Vancouver Island. Anchovies were slaying them from Vernon Bay to Main Bay. 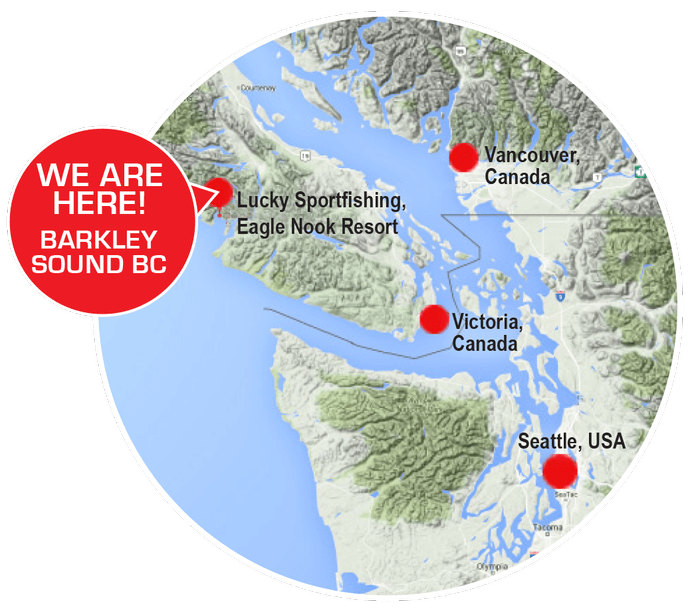 Barkley Sound, Vernon Bay, fishing anchovy for early season Chinook Salmon. Late afternoon tide change. Caught this Chinook salmon at 90ft and lost one that looked a bit bigger. We call that a long line release!